machineabstraite | Yet Another Book on “New Media"
Yet Another Book on “New Media"
I've just been included in another collective publication. 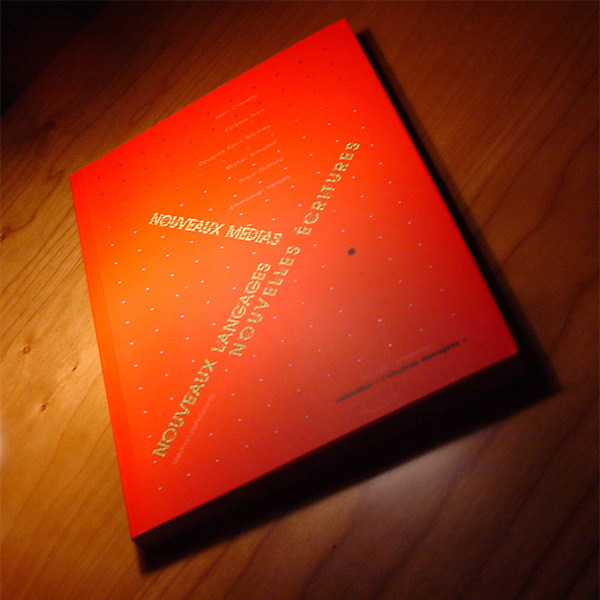 It's called Nouveaux médias, nouveaux langages, nouvelles écritures, and was edited by Colette Tron from the ECM/Alphabetville projet at the Friche bel de mai in Marseille. Alain Giffard is one of the contributors, as well as my friend and collaborator Jean Cristofol. My article is pretty wonky. The deal was this: we got together for two days of private presentations of each other's work. We debated several subjets and basically opinionated on this and that. And while Jean and I pretty much rejected the whole “New Media” moniker -- proposing instead a number of concepts we've been working on -- we ended up with a book entitled “New Media, blah blah blah”. Ho hum. I could tell things were going in this direction, so I just slapped together a quick and dirty little article. Colette Tron didn't like it, but Jean did, so I went with it. Apparently the publisher took to it as well, so there it is. Another little contribution. Ludovic Burel was also part of the discussion, but decided to drop out for some reason when it came to writing an article. Too bad. We met back at the Villa Arson years ago, where we were both fish out of water : I as lepered-artist-in-residence-in-limbo, while he was working as an intern. He does cool in-your-face icon "selections" for Multitudes. By the way, he was the only one with decent shoes -- figures, as he came from Paris. We'll be giving a presentation of the book at 18h30 on the 11th of January at the Cabaret Aléatoire, Friche bel de mai. Jean and I will be there. If you can read French, there is more information on Alain Giffard's blog.